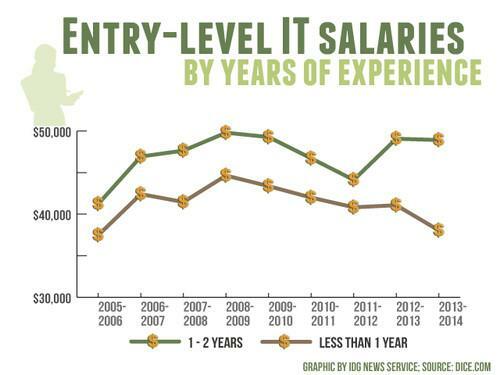 US salaries for entry-level technology jobs (in US$). Class of 2014 college graduates looking for their first IT jobs take note: your passion for and experience with technology may prove more helpful in your employment search than your diplomas. "I don't think in the past five-plus years I've hired someone based on their education," said Jim O'Neill, CIO of inbound marketing software company HubSpot in Cambridge, Massachusetts. "It's not a direct correlation to their success here." A person's attitude and aptitude stand out more than where they went to school, O'Neill said. While academia hasn't kept pace with the rapidly changing technology industry, the entry barriers to learning hands-on, practical IT skills have been "eradicated," he said. "With a credit card and 10 dollars you can buy a server at Amazon's cloud or Google's cloud or Rackspace's cloud," O'Neill said. "There's no excuse anymore. That's why I'm a little cynical on institutional education." At Dice, which includes IT career website Dice.com, an Android app a recent graduate of Fresno State College in California created on his own -- not his education -- earned him a mobile product manager position. "It's a great example of how someone who is graduating from Fresno State, not Stanford, can also work at a company like Dice because he was very proactive in building his own Android app," said Shravan Goli, president of Dice. Job candidates should collect data that shows how IT projects they completed in their spare time solved a business problem or gained traction among users, said Markus Schwarz, senior vice president, Global SAP Education. "What hiring managers are looking for is somebody who is able to consciously plan to approach a certain problem," he said. "They need to prove that they can connect the world they're familiar with -- technology -- with the worlds of business and the business user." Some companies realize that new hires may lack some of a job's desired skills and are willing to train the right candidate. "A very passionate, talented individual who wants to come in and get involved, you're going to find most employers are open-minded to taking a chance, especially if they prove to understand the industry and have a focus as far as what area they want to get into," said Ray Lowrey, CIO of McGraw-Hill Education. Entry-level applicants shouldn't discount their participation in collegiate clubs, groups and sports teams. These activities appeal to employers since those experiences teach important soft skills like collaboration and being open to diversity. "It's really important that they demonstrate the capabilities away from the keyboard, that they can really work in a team to determine customer requirements and translate that into technology," Schwarz said. To gain resume-boosting IT skills -- and network for job leads -- new workers can participate in hackathons, contribute code to open-source projects, attend boot camps or get involved with user groups. "Recruiters are also swarming meet-ups these days," Goli said. "These are great ways to make connections with your peers and connect with the people that are hiring." "College students shouldn't feel intimidated about going," O'Neill said. "They should be running to because entrepreneurs are so excited to talk to young, fresh emerging talent." Even the venerable internship is viewed as a recruiting tool. "Given that companies have such a short supply of technology professionals, there are a lot of companies that are entertaining internships ever more so," Goli said. For Schwarz, an internship doesn't only include working at a standard IT company. Performing database administration for a professor's research project is equally valuable work experience. "They need to relate a proof point of their ability to absorb technological knowledge," he said. User communities always welcome new participants and current members often tap them to find talent when their company is hiring, Lowery said. "Making yourself visible and getting involved doesn't require you to be employed," he said. Graduates who are especially interested in learning about trendy technologies and making "themselves more valuable, even if it's at an entry level" should remember that emerging technologies evolved from primary languages like Java, C++ and SQL, Goli said. "Knowing those basic technologies and knowing how those technologies map to the latest technologies can also help them figure out which one they can get training around." A graduate who knows Java, for example, and wants to become a Hadoop developer could learn the popular large data processing software by taking a course offered by Cloudera, a Hadoop vendor. Of course, having an online presence can help a graduate get noticed since "the world is digital now," O'Neill said. Companies use social-media platforms, open-source code repositories and other public data sources to identify applicants and review their credentials. "We do look at Github and actively look at people," O'Neill said. "We try to see what their online street credibility is. That's usually a huge indication of the quality and the passion of their craftsmanship." Goli encourages graduates to "pick relevant places, participate, be active and be noticed. Your publicly available data becomes your publicly accessible technology profile." Job seekers will find a strong market, Goli said, especially for positions involving large-scale data analysis, security and mobile development. Entry-level employment prospects are much better compared to the hiring environment during the recession. As for when to start their job search, college students who begin after graduation aren't necessarily at a disadvantage, although some employers don't wait until closer to commencement time to begin recruiting entry-level workers. "The job market probably isn't as cyclical as what it used to be," Lowrey said. "You have some startup operations that are going to occur whenever they occur." Startups -- known for having flexible hours, lax dress codes and fast-paced environments -- offer an environment that is similar to college, Goli said. Companies that are preparing to issue an initial public offering or have just gone public are usually in high-growth mode and are looking to hire workers, he said. They may be flexible on the skill requirements since they're trying to increase productivity quickly. And with a range of businesses investing in IT, "all companies are becoming tech employers," Goli said, so graduates should consider jobs outside of traditional IT employers. Given the demand for talented technology workers, some companies make job offers for roles that don't start immediately. HubSpot recruits from hackathons and other less traditional technology events, which tend to be held in the fall or winter, O'Neill said. Skilled college students who attend those events may receive an offer for a position that starts the following spring or summer. Recent graduates should have an "awareness of the different paths you can follow within technology, none of which will paint you into a corner," Lowery said. O'Neill, whose company develops software that runs in the cloud, said the advent of SaaS has turned IT career development into choosing your own adventure. "Companies are becoming more and more flexible in the light of the fact that managing servers is going away," he said. For example, learning SaaS maintenance in a help-desk position could lead to an integration developer role combining different cloud services. A person could then start building products internally that combine workflows across SaaS platforms. Ultimately, a company may decide to sell some of those products, said O'Neill. "The opportunities for IT folks -- particularly emerging IT folks -- is how can you apply a product mindset to classically what was an administrative mindset. If you can bridge that gap, your career is endless because you can actually grow into a product engineer if you want to."